Contrary to public claims by the gun industry and the gun lobby, firearms ownership has declined dramatically over the past 35 years according to new survey data from the General Social Survey (GSS) released today by the National Opinion Research Center (NORC) at the University of Chicago. Except for the U.S. Census, the GSS is the most frequently analyzed source of information in the social sciences and is the only survey that has tracked the opinions of Americans over an extended period of time. The NORC data comes out the same week that the National Rifle Association (NRA) begins its annual convention this Thursday in St. Louis, MO. 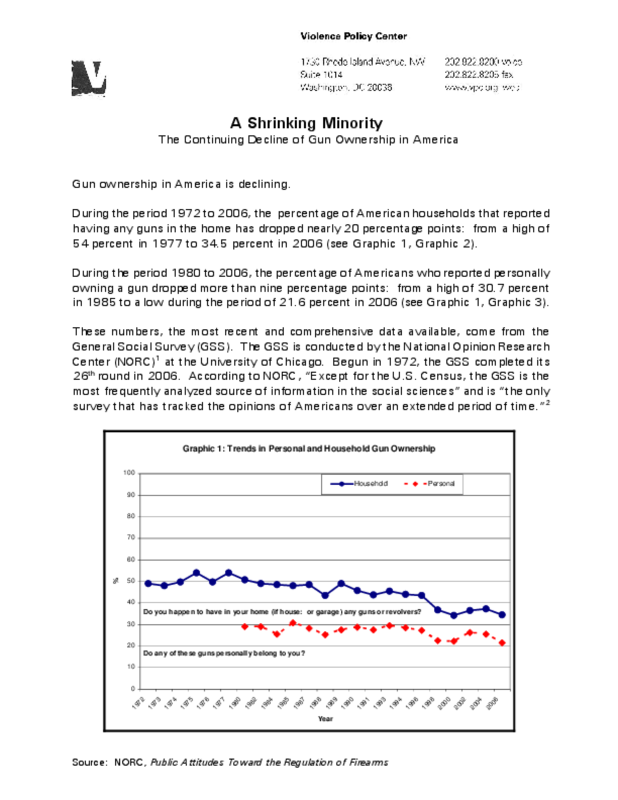 The NORC data shows that during the period 1972 to 2006, the percentage of American households that reported having any guns in the home has dropped nearly 20 percentage points: from a high of 54 percent in 1977 to 34.5 percent in 2006. The data also shows that during the period 1980 to 2006, the percentage of Americans who reported personally owning a gun dropped more than nine percentage points: from a high of 30.7 percent in 1985 to a low during the survey period of 21.6 percent in 2006. Copyright 2007 Violence Policy Center. All rights reserved.